The story is about a bunch of guys ( and later one girl, Teresa played by Kayla Scodelario - in whom I could only see Effy ) who have been sent to a place with a Maze. 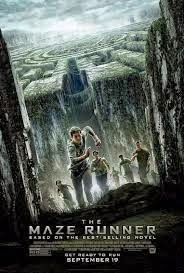 They learnt how to live there and got the so called "runners" in their little society, who go out every day to explore the Maze- with the hope of getting out somehow through it- . As the protagonist, Thomas ( Dylan O'Brien ) arrives at the Glade, that's when the changes start to happen and everything gets exciting and adventurous. I don't want to spoiler more about the story, so I will stop here. It has been a really long time since I enjoyed a film this much. In the cinema, I was gripping my seat ( and my friend's hand ) as the fighting scenes set off. However the most surprising thing was the fact that I surprised at the end of the movie. It hasn't happened to me in a really long time. If you've seen it, please share your opinion!